South of Central Anatolian Region between the provinces of Konya, Icel, and Antalya, Karaman is an important centre of commerce, culture, and arts. Karaman and its environs, has been settled since 8000 B.C., charming tourists with attractions such as underground cities, caves, centres of religious tourism, and highlands, natural beauties and rich samples of handicraft. History and natural beauties co-exist in Karaman. Settlement in the region is believed to date back to Neolithic and Chalcolithic Periods. An important centre in Roman times when Christianity was spreading, Karaman, along with its environs, retained its value during Byzantine times. Karaman’s name, which used to be Laranda, became Larende under Turkish reign. It became a land of the Danishmends in the beginning of the 12th century and that of the Seljuks in 1165 during the reign of Kilic Arslan II. Although Cilician king Leo II captured the area in 1210, Izzeddin Keykavus took the lost properties back in1216. The city was left for Harzemsahs circa 1230. The seeds of the Karamanid Principality were sown in 1235, and it was established in the middle of the 12th century. At the turn of the 13th century, the Karamanids made Laranda a centre, and at the time of the Turkish Republic Laranda’s name became Karaman because of the Karamanids. During the wars that continued between the Ottomans and the Karamanids, the Ottomans took the city several times. After the Principality of Karamanid collapsed, the city became an Ottoman land in 1466. 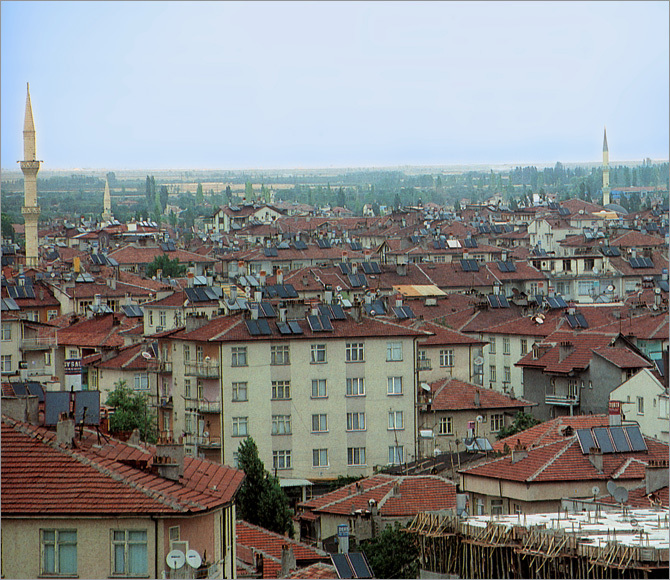 A centre of industry, culture, and tourism, Karaman became the 70th province of Turkey in 1989. Karaman (downtown), Ayranci, Basyayla, Ermenek, Kazimkarabekir. The Hittites and Assyrians inhabited it in ancient history. In the valley that stretches as far as the Taurus Mountains are twelve bridges. The structures bear the traces of the Ottoman architectural style. In the county are unspoilt historic tourist attractions, important highlands, and promenades. The most important of them are Tozmugar and Dibekli highlands. The cave in Tozmugaris is worth seeing. The county is one of the first settlements in history. It is rich in touristic worth such as the Meraspolis Cave, Ikiz In Hittite bas-relief, sarcophaguses, and sculptures, Gormel Bridge, Ermenek Castle, Mennan Castle, Tol Madrasah, and Zeyve Bazaar. According to the findings from archaeological research, the county, located between the provinces of Konya and Karaman, has been home to various civilizations since the Hittites. It was an important settlement for the Romans. It became a county in 1989. It is known for its honey, cherries, and walnuts. The Barcin highland, famous for its pastures, is in this county. Besides breeding stock, its people produce rugs and carpets. Located in downtown Karaman, the museum is behind the Hatuniye Madrasah, one of the most beautiful architectural examples of the Karamanid Principality period. In Karaman and its environs are a number of tumuli and ancient ruins. However, since the museum in Karaman was established quite recently, many of the portable works were taken to other museums. The museum is a two-story building. On the ground floor are an exhibition hall, a storage area, a photography laboratory, a workshop, and a library. The exhibition hall in the upper floor consists of two sections. The archaeological section houses works from many civilizations ranging from the Neolithic Age to late Byzantine period. Especially striking in the exhibition are the works from Neolithic-Chalcolithic Ages excavated in Canhasan Tumulus. The ethnographic section holds works from the Seljuk, Anatolian principalities, Ottoman, and the Turkish Republic periods. In the museum garden are displayed stone works belonging to the Byzantine and the Turkish-Islamic period, the majority of which are Roman tomb steles. They are 5.5 kilometres south of the village of Suleymanhaci, Karaman, between Mount Ali and Hotamis Marsh. The archaeological excavations started in 1994 revealed finds dating from Palaeolithic, Neolithic, Old Bronze, Roman and Byzantine periods. The stone tools are made of obsidian and silex. Pinarbasi is important for the findings from the pre-agrarian cultures. Epipaleolithic Period, (circa 10.000- 8.000 B.C. ), was a time when people did not farm, or tame animals but lived a life of hunter-gatherers. Traces from this period have been discovered in the region. In the village of Canhasan (Alacali) thirteen kilometres from Karaman, the tumuli consist of three parts. Canhasan III; belongs to the Aceramic period. It has a diameter of about 100 m. It dates back to 6500 B.C. They are rectangular adobe houses without stone foundations and are surrounded by walls built with wooden supports. Among the discoveries in the tumulus are obsidian tools, knives, various bone tools, big spoons, needles, spatulas, and pipe-shaped bone necklaces. Canhasan I; has a diameter of 380-400 m. Excavations have revealed seven layers of settlement. Those between the fourth and seventh layers belong to late Neolithic period (6000 B.C.) with the first three to the Chalcolithic Period (5500 - 3000 B.C.). In Canhasan I, the two-story houses are made from adobe. Copper has been discovered on the floors belonging to the Chalcolithic Period. Also among the finds is ceramic. Necklaces from precious stones and mussel shells, bracelets and bone ornaments, and figurines were found in the tumuli too. The tumulus was abandoned in about 4300 B.C., and was later settled again in Hellenistic, Roman, and early Byzantine periods. It is 35 kilometres north of downtown Karaman on the skirts of Mount Karadag. There are a lot of churches, monasteries, basilicas, dwellings, and cemeteries built between the 4th and 9th centuries (Byzantine period). Although there are Byzantine ruins on many hills and skirts of Karadag, these structures are more commonly found in the village of Madensehir 37 kilometres from Karaman and in Yukari Degle, 7 kilometres from Madensehir. Early Christian architectural features are mixed with those of local art styles in the structures spread over the hills and skirts of Karadag. Buyuk (Great) Church: The entrance of the church, made from smooth cut stones, and its nine-arched left wing still stand. To its north is a big cistern. The Canli Kilise (Living Church) north of the city is in ruins. Right in the middle of the city is a cemetery. Moreover, inscriptions and sacred areas remaining from the Hittites can be found in the plains. It is three kilometres north of the village of Ekinozu (Asiran), 23 kilometres from Karaman. The Derbe Church is said to be one of the first churches built in the world. This church was built in 41 A.D., thirteen years before the Church of Virgin Mary in Ephesus. Christians make the pilgrimage to Derbe. On the grounds of this quite wide and high tumulus are discovered pieces of pottery from Bronze Age, Hellenistic, Roman, and Byzantine periods. The word Derbe was found on the two tablets found near the tumulus. It is in the village of Akcaalan 60 kilometres west to Karaman. Founded by Antioch in 38 A.D., the city is on one of the Roman roads, and has domed underground graves, bas-relief sculptures, and tablets. It is an archaeologically protected area. Stone tablets from Hellenistic, Roman and Byzantine periods have been found in Lystra Tumulus in the town of Yollarbasi. Completely covered with trees today, the area is used as a resort. 46 kilometres north of Karaman, the Granaries are worth seeing. They consist of 251 granaries, each almost 40 meters high. The granaries, which usually have two sections, hold barley, wheat, and legumes. About 50-60 tons of grain can be kept in them. The granaries are made from clay-lime stone and provide air circulation four seasons. One can climb them using the “ladders” on the sides. Grains are put inside and taken out of the granaries still in use today using a pulley system. It is possible to keep wheat fresh for 8-10 years in these stone granaries, which are believed to have been used since early Christian periods. The Ministry of Culture declares the region to be a primary protected area. It is 12 kilometres from Ermenek. Carved into a huge rock on two adjoining caves, the bas-relief has the figures of a snake and a lion on it. A great number of sculpted stones have been found in the area. Here can be found hundreds of rock graves dating from Hellenistic, Roman, and Byzantine periods. Most of them are in the rocky region north of the village of Gokceseki (Camlica), Ermenek. 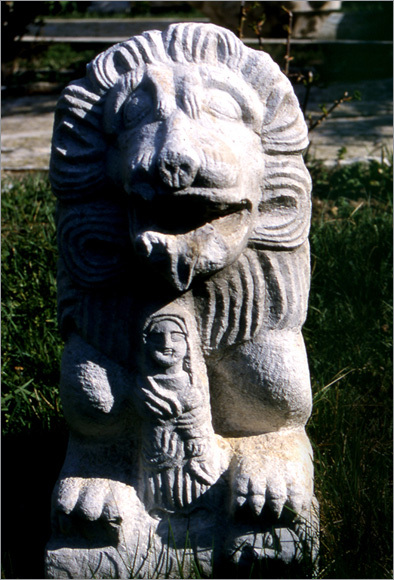 Most of the graves have lion sculptures. Some epitaphs have also been discovered. The open wide area between the villages of Goktepe and Cukurbag is scattered with stone columns, shrines carved out of rocks, and ruins of tombs. Headpieces and reliefs can be found at the entrance of the caves. On the southern ridges of rocky hill extending to the north of the village of Kirazliyayla, county of Basyayla, are thousands of rock graves and dwellings. Humans dug the caves, and some were used as dwellings. The ruins are believed to belong to the ancient city of Lavrados. The ruins found near the village of Yukari Caglar, county of Ermenek, are believed to belong to an ancient city. Graves carved into rocks, sarcophagus vessels with lion heads on them, and aqueducts show traces of Roman civilization. 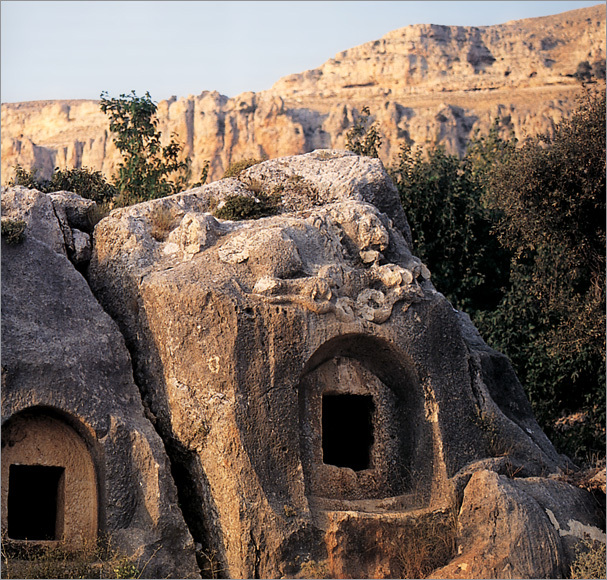 The cave settlement in the village of Guldere, 45 kilometres from Karaman, dates back to the Byzantine period. The entrance of the big cave is in ruins. 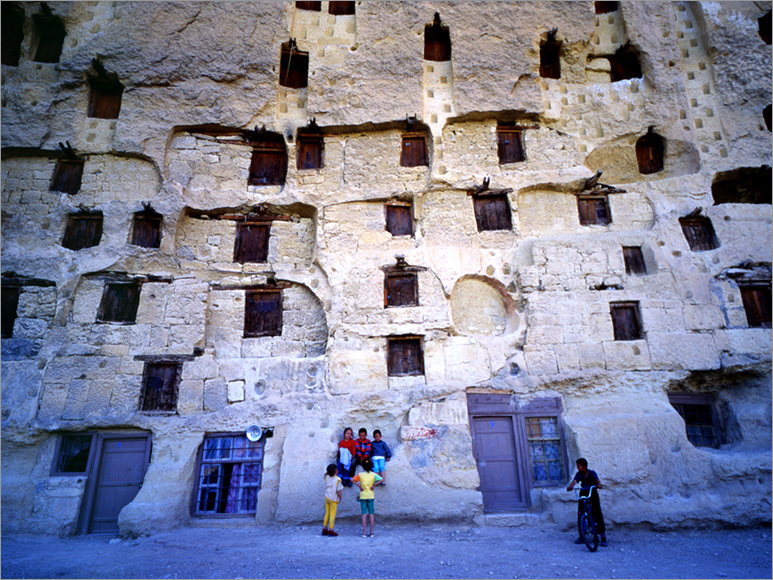 Dwellings carved up to eight floors into the rocks can be seen. Near the same area are more simple structures. These are in the villages of Pasabagi and Gokce. Built in the downtown area solely from cut stone at the time of the Karamanids (1370), the mosque has a large single dome and a high minaret. 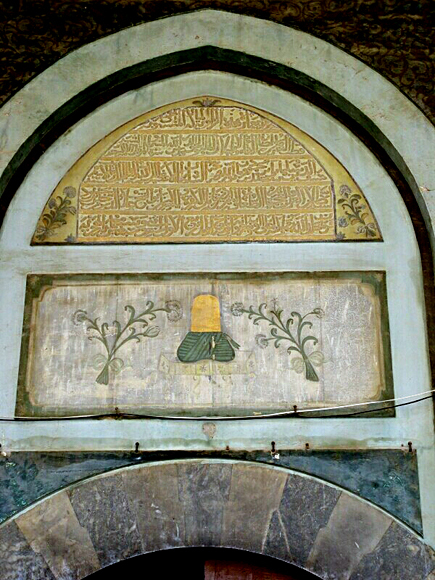 Inside the mosque are the sarcophaguses of Mevlana’s mother Mumine Hatun, his grand children, and other relatives of his. The mosque, dating from the Karamanids, is in Kirisci quarter of Karaman. It is made from cut stone and has a home in the centre. West of the mosque is the tomb of Yunus Emre, famous Turkish Sufi. The mosque in the Mansurdere quarter of Karaman is a transverse building. It was built in 1436 and repaired in 1901. It is in the Topucak quarter of Karaman. It was built between 1374 and 1420 and repaired in 1814. 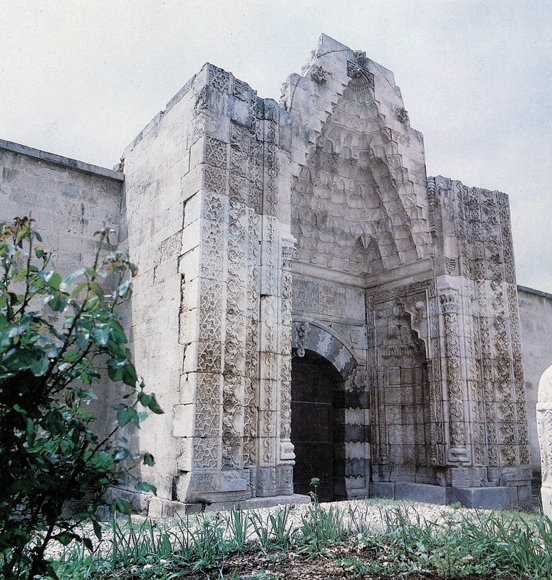 Next to Aktepe Mosque in the Kulhan quarter of Karaman, Seyfeddin Hacibeyler commissioned the mosque in 1356. The mosque, located in Siyahser quarter of Karaman, is made from cut stone. It has a dervish lodge, a hostel, and a tomb. The Karamanids built it. Built in the Karamanid Era, the mosque is in Hisar quarter of Karaman. The mosque is located in Gazidukkan quarter. Made from cut stone, it is believed to have been built in the late 15th century. It is in Kocakdede quarter. Belonging to the Ottoman period, the mosque was built in 1596 by Nuh Pasa. 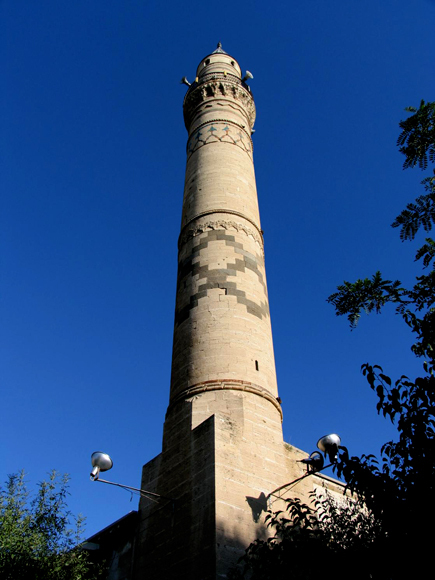 Located in Topucak quarter on Dahak Street, the mosque has a long minaret, four columns, two sections, a long minaret, and a transverse plan. It is in Ahiosman quarter. It is known to have been built in 1522 by Cambazzade Kadi Abdurrahman Efendi. It is in the town of Akcasehir. The Karamanids made it from cut stone. Located in the town of Yollarbasi 15 kilometres from Karaman, the mosque is a transverse cut stone structure built by the Karamanids. It is located in the county of Kazimkarabekir 25 kilometres from Karaman. Being one of the finest works by the Karamanids, it definitely is worth seeing. It is in the village of Davgandos (Cigdemli) 15 kilometres from Karaman. It is an Ottoman structure dating back to the early 16th century. It is in Gulpazar quarters of Ermenek. Karamanoglu Mehmet Bey built it in 1302. The engravings on its wooden door display one of the best examples of calligraphy. It is in the town of Yesildere (Ibrala) east of Karaman. Built as a Byzantine church, it was turned into a mosque in 1649. Built on a rock mass in Derekoy, seven kilometres south of Karaman, it was later turned into a mosque. It is in downtown Karaman. Made completely from cut stone, the small mosque was built in 1247 by the Seljuks. Made from the white cut stone of Kurtderesi, the small mosque belongs to the Karamanid period. It is in Akcamescid quarter in Ermenek. Haci Ferruh commissioned it in 1300. Its wooden door is an example of Karamanid woodcarving. The tomb, located in the Hisar quarter of Karaman, is made completely from cut stone. It is covered with a dome inside and a sliced cone outside. Located in Tahsin Unal quarter of Karaman, the tomb is a square building made from cut stones. Its round dome is placed on an octagonal frame. Located in Abbas quarter of Karaman and made completely from cut stone, the tomb is an octagonal structure with a dome on it. It is in Abbas quarters of Karaman. It is a square building made from cut stone. It has a pyramidal roof. Located in Imaret quarter of Karaman, the tomb is a structure made from cut stone that rises on an octagonal column placed on a square plinth. It is covered with a pyramidal roof. It is behind Karabas Veli Kulliye (Religious Complex). It is an octagonal structure made from cut stone. Its top cover has collapsed. It is inside Karaman city cemetery. Made from cut stone, the octagonal tomb has a round dome. Located in the village of Balgusan, 25 kilometres from Ermenek, the tomb is the only structure that remains from a building complex of a mosque, a hostel, and a theological school. The tomb, made from cut stone, is octagonal and has a round dome. It is in downtown Karaman. Nefise Sultan, daughter of Murat I and wife of Karamanoglu Alaaddin Bey, had the architect Numan bin Hoca Ahmed build the Madrasah in 1381 and 1382. The ornamented white marble door is one of the finest examples of Karamanid architectural style. Emir Burhaneddin Musa Bey had it built in downtown Karaman in the middle of the 14th century. The Karamanid Ibrahim Bey had it built downtown in 1432–1433. It bears the typical architectural features of its time, and thus is worth seeing. It is built on a tumulus in Kale Hisar quarter. The exact date of construction is not known. It is supposed to have been built by the Seljuks at the end of the 11th century or the beginning of the 12th century. Karaman Castle consists of walls inside one another. Today only a small part of the outer walls remains. The inner castle stands with all its magnificence. The castle is one of the most imposing standing castles in Turkey. The castle has nine bastions. North of the county, ramparts built from cut stone and mortar on steep rocks protects the castle. It was used as refuge, house, and dungeon. The first castle of the Karamanids, it has natural caves in it. It is located in the middle of the rock hill that surrounds the north of Ermenek. “It is a castle built by the power of God in the midst of a red mountain that blocks the skies. It is an imposing castle that must be seen. It must definitely be seen and watched. I have travelled eighteen kingdoms on land and at sea, but never seen a castle like it.” says Evliya Celebi, talking of the castle in his travels. It is in Ermenek. Mennan means refuge. The castle is constructed on a steep mountain with sheer cliffs, and travel is extremely difficult. The two-towered structure has a cistern and ruins of other buildings. It is in Imirme in the town of Yollarbasi, Karaman. It dates from early Byzantine period. It is also called Lystra Castle. Near the castle is a Byzantine church. It is in the village of Divle, Ayranci. The multi-story castle, which resembles an apartment building, was used as a house for many. The Seljuks, Karamanids, and Ottomans actively used it. Small narrow doors join the rooms inside the castle. Only the entrance gate stands today of the castle in the county of Kazimkarabekir. It is 40 kilometres from Karaman. It is a large sultan’s inn built by the Seljuks in the 12th century. It is one kilometre southeast of the village of Ihsaniye. Believed to have been built by the Karamanids, it has an arched entrance. It is on the historical Silk Road between Karaman and Ayranci near the village of Huyukburun. It does not have inscriptions. It is en route Karaman - Mut road, and 30 kilometres from Karaman. The inn, which does not have inscriptions, belongs to the Karamanid period. The covered bazaar in the county of Kazimkarabekir was built by the Ottomans. It has two doors. It is en route Karaman - Mut road at Sertavul Passage beside Seyh Yunus Hill. It was built during the Karamanid period. It does not have inscriptions. It is located downtown east of Aktekke Mosque. It has a central dome and is made of stone. Eight steps lead down the bath. The building is restored and open to use. Located downtown, the bath resembles Suleyman Pasa Bath architecturally. It has a big central dome. It has different sections for men and women. Located downtown, the bath is made from cut stone. Because it does not have an epigraph, the date of construction is unknown. It has 12 marble basins, and a part of it, called the small bath, is reserved for women. This downtown bath is not used today. It is made from cut stone. Its dressing room has a tiled roof. Its iliklik, or lobby, is arched, and its sicaklik, or the main bath, is domed. Located in the town of Yesildere, Ibrala Bath is in the Mecca direction of the Church Mosque. It is one of the finest examples of Ottoman bath architecture. The bath, located in the county of Kazimkarabekir, has two indoor and two outdoor sections for bathing. The women’s section of the bath is in ruins. It is one of the most beautiful works surviving from the Karamanids. 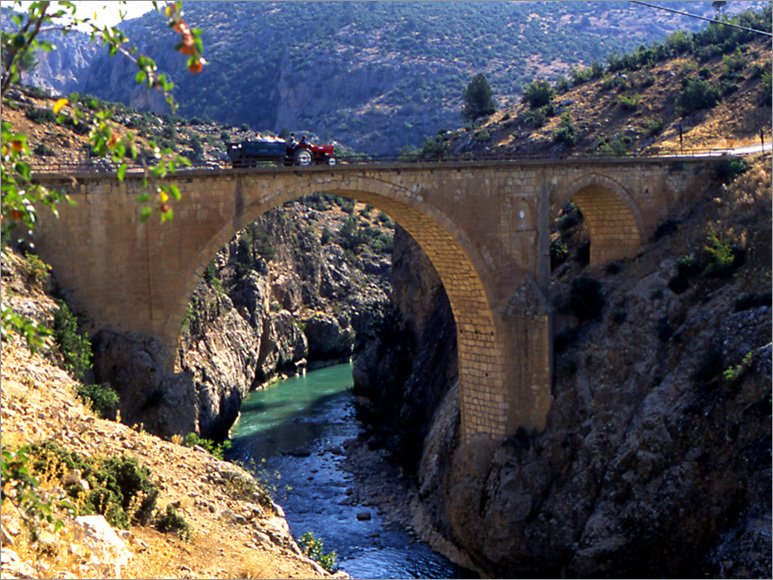 Located in Ermenek, the bridge is built on two big arches. It is 27 meters in length and 4.70 meters in width. It was built by Halil Bey, son of Karamanoglu Mahmut Bey. Built by the Karamanids, the bridge is located in the county of Ayranci. A Karamanid structure, the bridge runs across the Goksu River. It is 15 meters long, 3 meters wide and 12 meters high. It is made from stone and built on two columns. It is in the town of Yesildere on the Ibrala Brook. It belongs to the Karamanid period. It is in Topucak quarter. The church is an example of the small basilicas in the Thousand Church. Built in early Christian times, the rock monastery is located on the southwestern slope of Mount Yumrutepe, east of Ermenek. It consists of interconnected caves and rooms. Located in the village of Ardickaya, Ermenek, the monastery is carved into rocks. 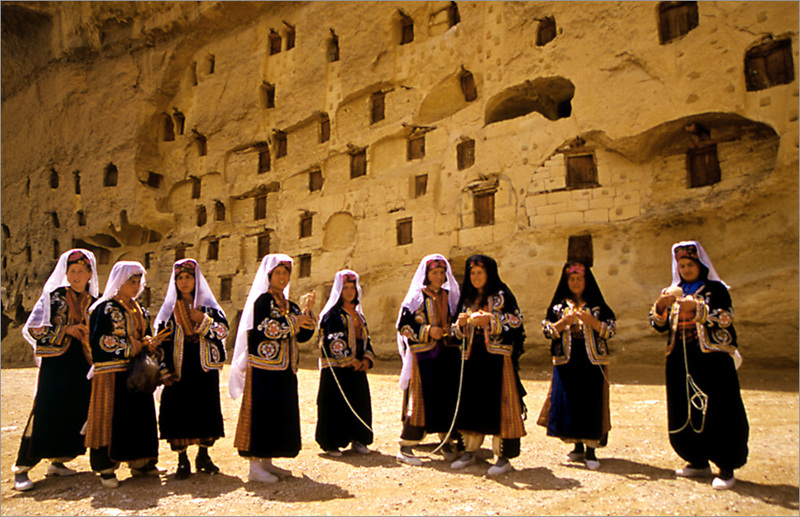 Located in the town of Kazanci, the monastery is carved into rocks. It is in Ermenek. There are many rock graves in the area between the entrance of the Meraspoli Cave and Firan Castle. It is a 20-meter high mansion carved into rocks. Karaman attracts tourists as much for its historic works as its natural beauties. If you are interested in caves, we can say those in this city are quite interesting. Enter the Hislayik Cave in the county of Ayranci from a 26-meter vertical chimney. After the entrance, you get to an underground river. The Manazan Cave is in Taskale, Karaman. It is an interesting five-story cave with its many tunnels, galleries, and rooms carved into the rocks. Climb between the stories through a system of ladders in which places for feet and hands are carved on opposite sides. These ladders are unique in Turkey. Meraspoli Cave is in Ermenek. The cave has two entrances, and is accepted by experts to be the third biggest cave in the world. An underground river flows across the cave. Also in this area are Incesu Cave, Asarini Cave, Divle Pit, Goves Village Caves and Godet Cave. Karaman highlands are used by the locals in the spring for their clean water, fresh air, and grassy fields to graze animals. Since they are en route the Mediterranean, both domestic and foreign tourists come to the highlands on daily trips. Especially the highlands in the Ermenek area are suitable for trekking, and they have facilities and natural resources. Therefore, they are also preferred by picnic goers. The Eregli Reeds (Akgol) between Konya and Karaman is an interesting place for birdwatchers. The Ermenek Brook is quite good for rafting. You should remember to visit the Zeyve bazaar when you are sightseeing in Karaman. The spot is a resort with its water mills, plane trees, cascades, and cold water. Villagers from nearby villages sell all kinds of necessities including fruit and vegetables. Moreover, a bazaar is set every Sunday. Zeyve kebab and tea made on wood fire are famous. Zeyve Bazaar is a spot worth seeing. Akdem Trout Facility is near the village of Gokce. It is 19 kilometres from Karaman. The facility is big enough to serve 200 customers at one time. You can have a delicious meal if you drop by. It has different sections for the summer and winter. Wood carving, carpentry, and furniture making are popular in the region. Also, you can buy handiworks, embroideries, and laces. Especially rugs (Taskale, Sirvan, Koras rugs) bear features unique to the region.